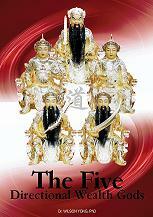 • An Introduction of the 5 Directional Wealth Gods, how to beseech them to confers Wealth! • Uncovered how to set up an altar to worship the 5 Directional Wealth Gods. • A detailed description of the entire practice, includes a set of offering for the wealth deities, talismans of the 5 Directional Wealth Gods. • An explanations of the myriads benefits of practising the wealth gods practice.